Knit on the go with this convenient bag made from a blend of organic cotton and recycled plastic bottles. 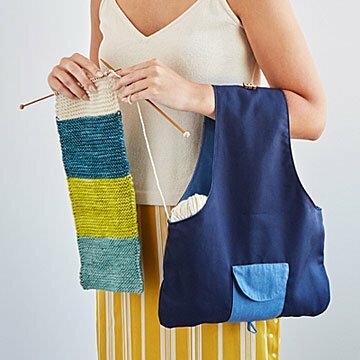 Turn any downtime, whether you're in line at the movies or in flight across country, into an opportunity to knit your next masterpiece with this convenient carry-all. Made from a blend of organic cotton and recycled plastic bottles, and featuring a charming wooden sheep detail, it holds an oversized skein of yarn (or 2-3 balls), needles, and other knitting necessities, for crafty fun on the go. Even tiny tools, like your row counter, tape measure, and small scissors are easy-access in the exterior snap pocket. It also folds to fit in a larger bag or suitcase, where that little sheep (actually a button) keeps everything wrapped up cozy. When you're ready to start stitching--anywhere--just hang the handles over your arm, pull out a string and get your knit on. Made in North Carolina. Exclusively at UncommonGoods. Hand wash; do not soak wood button. This bag is compact and perfect for a project like a scarf. I love being able to loop it over my arm and knit on the go! This product was exactly what I wanted to purchase. Well made. Would buy again. Looks exactly as pictured online and in catalog. My sister had to return this bag because it was way too small for knitting accessories. I was shocked at the small size of the bag. It seems to be made for the amount of yarn and project needed to provide for a doll. My wife makes sweaters, hats, scarves, and blankets for people and her needles, partially made item, and more yarn could in no way fit in this. I wasn't expecting storage, but I laughed out loud when I opened it. My mother in law is able to carry her current knitting project with ease. There is a cute little pocket that's perfect for stitch markers or other small knitting accessories. My mom loved this gift!! She is always moving her knitting stuff around the house and she said it would be really helpful to have a bag she could just keep everything in. She also thought it was super cute! My grandmother really loved this gift. She usually makes blankets for people a few times a year so this will keep all of her things in one place while she works. Often she moves to new spots in the house and this is the perfect thing for easy relocation! Love it!!!! An idea- line the handle with soft wooly material for comfort.